Meet the man and uncover the story behind one of Australia’s most recognised brands. We all know Jim’s, but do you know the real story behind the Jim’s Group and its founder, Jim Penman? Brutally efficient, socially awkward, and a tireless perfectionist, Jim is as complex and fascinating as the Jim’s Group. Jim’s unique approach revolutionised Australia’s business landscape, providing thousands of people the opportunity to create and grow their own businesses. 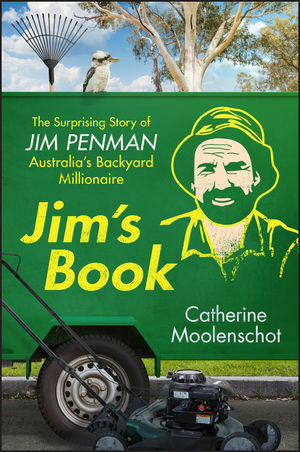 Jim’s Book tells the fascinating story of the man and the business that bears his name. Equal parts biography, history and philosophy, this book takes readers on a journey through one man’s remarkable life. Catherine Moolenschot is a speaker, author, ghostwriter, and book writing mentor. She wrote her first book, A Rough Road, at 13 and her second, Failure Is Underrated, at 17. Since delivering her first TEDx talk 'Living Your Funnel of Greatness' in 2012, Catherine has presented at events all over Australia and internationally, speaking on the nature of success at schools, universities, corporate organisations, and at startup events. Her latest novel, I Am Megan, is being released on June 30th 2018. Click here to read a sample chapter on how Jim Penman ignored conventional thinking to turn a few mowing rounds into a corporate juggernaut built on always putting the customer first.